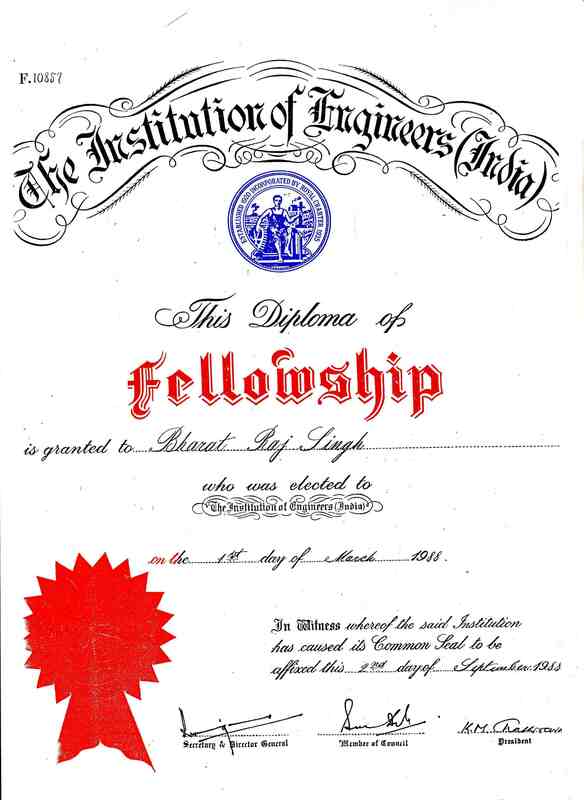 Fellow of Institution of Engineer's India FIE-010857/6 (M) in 1985. 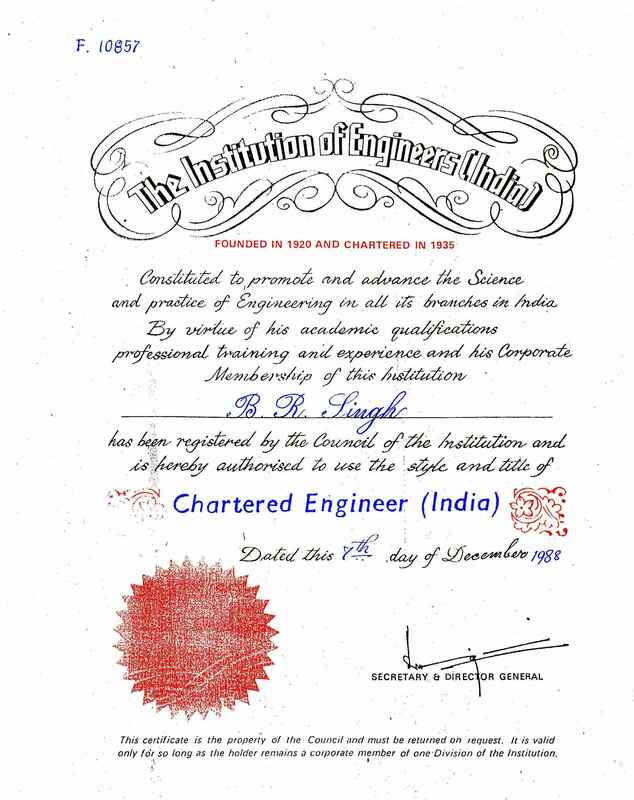 Chartered Engineer of Institution of Engineer's India CE-010857 in 1985. 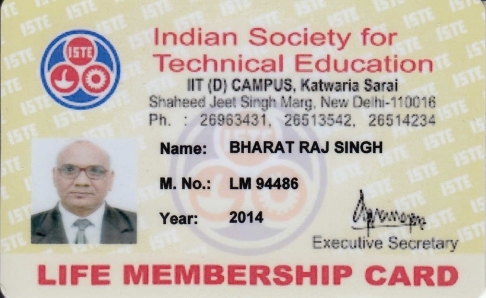 Member of International Association of Engineers IAENG-105641 (M) in 2010. Expert Group Member-Council of Science & Technology, Govt. 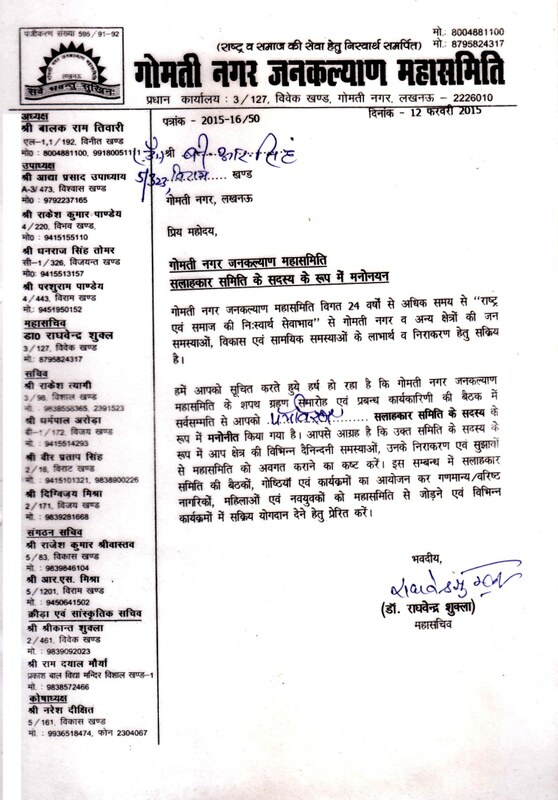 of UP-for 3-Years vide OM:CST/D-2330 dated: Dec. 04, 2013. Ex-Exam Committee Member-UP State Entrance Exam(UPSEE-2014), Govt. of UPvide UPSEE2014/Results/2014-06 dated: May 25, 2014. Editor-in-Chief- JPSET- SAMRIDDHI-A Journal of Physical Sciences, Engineering and Technology ISSN:2229-7111. 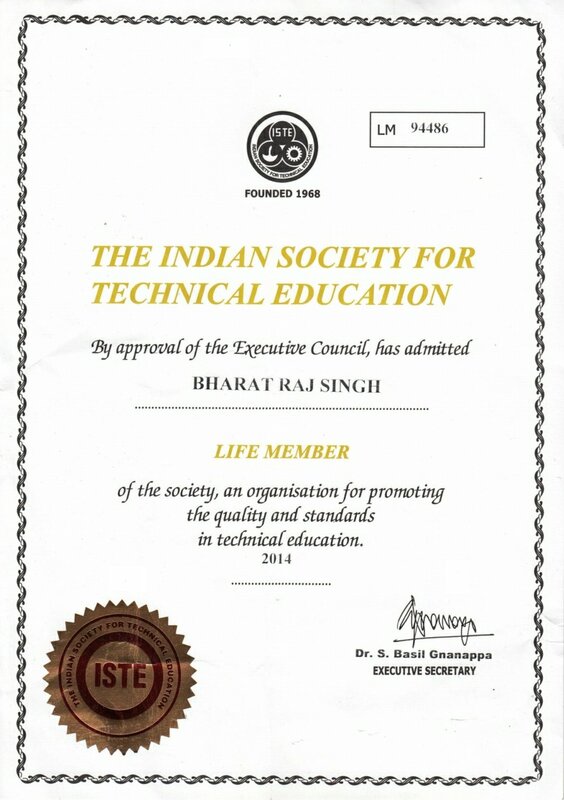 Member of Editorial Board- WASET- World Academy of Science, Engineering and Technology ISSN: 2010-3778. Member of Editorial Board- RJASET- Maxwell Science ISSN:2040-7459. Member of Editorial Board- IJET- Engg Journals Publications ISSN:0975-4024. Member of Council- GJRE, USA- Welcome to Council of Peer Reviewers ISSN:0975-5861. Member of Editorial Board- InTech Book Editor-Global Warming ISBN:979-953-307-820-4; DOI: 10.5772/2599. Member of Advisory Board- IJAET- International Journal of Advances in Engineering & TechnologyISSN:2231-1963. Member of Editorial Board- IJESET- International Journal of Engineering Sciences and Emerging Technologies ISSN: 2231-6604. Member of Editorial Board- JET- International Journal of Applied Engineering and Technology ISSN: 2233-398X. Member of Editorial Board- IJMER- International Journal of Modern Engineering Research ISSN: 2249 –6645. Member of Editorial Board- IJME- International Journal of Mechanical Engineering; ISSN: 2277-7059. Member of Editorial Board- GJAET - Global Journal of Advanced Engineering Technologies ISSN: 2277-6370. Member of Editorial Board- IJSER - International Journal of Scientific and Engineering Research, Houston, USA ISSN: 2229-5518. Member of Advisory Board- GJMST - Global Journal of Management Scientific and Technology, New Delhi, India ISSN: 2277-5978. Member of Editorial Board- InTech Book Editor-Climate Change ISBN 978-953-51-0934-1; DOI: 10.5772/3459. Member of Editorial Board-IJMSE - International Journal of Mechanic Systems Engineering, Hong Kong, China ISSN: 2225-7403 (Print); ISSN: 2226-6461(Online). Member of ibridge-Linking Ideas & Innovations, Kauffman Innovation Network, Inc., 4801 Rockhill Road, Kansas City, MO 64110. Member of Advisory / Editorial Board-IJETAE - International Journal of Emerging Technology and Advanced Engineering, INDIA ISSN 2250–2459(Online). Editor-in-Chief IRJESTI - International Research Journal of Engineering Science, Technology and Innovation; Nigeria ISSN:2315-5663; Aug 2012. Member of Editorial Board IJMRA - International Journal of Multidisciplinary Research Academic, USA; appointment for i). IJMIE - ISSN:2249-0558 and ii). IJMT - ISSN:2249-1058. Member of Editorial Board IJAIEM - International Journal of Application or Innovation in Engineering & Management; - ISSN:2319-4847. Member of Editorial Board IJMER - International JOurnal of Mechanical Engineering and Research; - ISSN:2249-0019(Online). Member of Editorial Board IIRJC -i-Xplore International Research JOurnal Consortium; - ISSN: 2319 - 4413(Online). Member of Editorial Board IJREAT - International JOurnal of Research in Engineering and Advanced Technology; - ISSN: 2320 - 8791(Online). Member of Editorial Board GJMSE - GLOBAL Journal for Management Science and Engineering; - ISSN: XXXX - XXXX(Online). Member of Editorial Board WSJEA - World Science Journal of Engineering Applications; -World Science Publications conducted by World Standard Organization (WSO). Member of Editorial Board WSJAR - World Science Journal of Applied Research; - World Science Publications conducted by World Standard Organization (WSO). Member of Editorial Board SJAS - Swiss Journal of Applied Sciences; -E-ISSN: 2307-3837; Swiss Journal Publications conducted by World Standard Organization (WSO). Member of Editorial Board IJOR - International Journals of Multidisciplinary Research Academy; -ISSN: 2249-05589 (Online); International Journal of Managment, IT and Engineering. Member of Editorial Board IPASJ International Journal of Management (IIJM); -ISSN: 2321-645X (Online). Member of Editorial Board International Journal of Research in Mechanical Engineering (IJRME); -ISSN: 2347-8772(print) & ISSN: 2347-5188 (Online). Member of Editorial Board International Journal of Innovative Technology and Research (IJITR); -ISSN: 2320-5547 (Online). Member of Editorial Board Journal of Mechanical Design and Vibration (JMDV); -ISSN: pending (Online). Member of Editorial Advisory Board InTech Book, Croatia; Appointment- Advisory Board of InTech Book Download . Member of Reviewer Council of Peer Reviewers-GJRE,USA - Global Journal, USA . Member of Editorial Board International Journal of Engineering Science Reviews-IJESR, USA . Member of Editorial Board International Journal of Advanced Mechanical Engineering(GBS- IJAME)-A GBS Publishers and Distributors, India . Member of Editorial Board International Journal of Management & Engineering(IJOR-IJMIE)-Indian Journals,A Product of Diva Enterprises, India . Member of Editorial Board International Journal Series in Multidisciplinary Research -IJSMR, India . Member of scopus.com & ID of scopus author for Prof. Bharat Raj Singh (http://www.scopus.com/authid/detail.url?authorId=36500361800). Member of orcid.org ID of Orcid.org for Prof. Bharat Raj Singh (http://orcid.org/0000-0001-6178-1718). Member of Evironmental Advisory Committee (Orderno. 15-16/50 Date: February 12, 2015) of Gomtinagar Jankalyan Mahasamiti, Lucknow, UP, India. Chairman, State Council Members, Institution of Engineers(India), UP State Centre, River Bank Colony, Lucknow-226018, UP, India. 1 / 2 -Letter from IE(I), Head Quarter, Kalkatta no. : sDG/sKB/0s3(18) Date: 27th Oct 2016 for the period / terms of: 2016-17 & 2017-18. Order of Nagar Palika for Member of Cleanliness Letter No:549/SNS-4/17 Date: 25-09-2017 from Jt. Municipal Commissioner, Lucknow.